01.02.1963 - 01.04.2019 Passed away peacefully at Moora District Hospital on Monday 1st April, 2019 after a short illness. 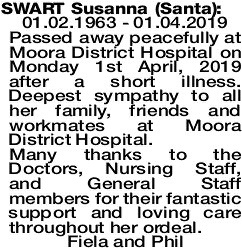 Deepest sympathy to all her family, friends and workmates at Moora District Hospital. Many thanks to the Doctors, Nursing Staff, and General Staff members for their fantastic support and loving care throughout her ordeal.